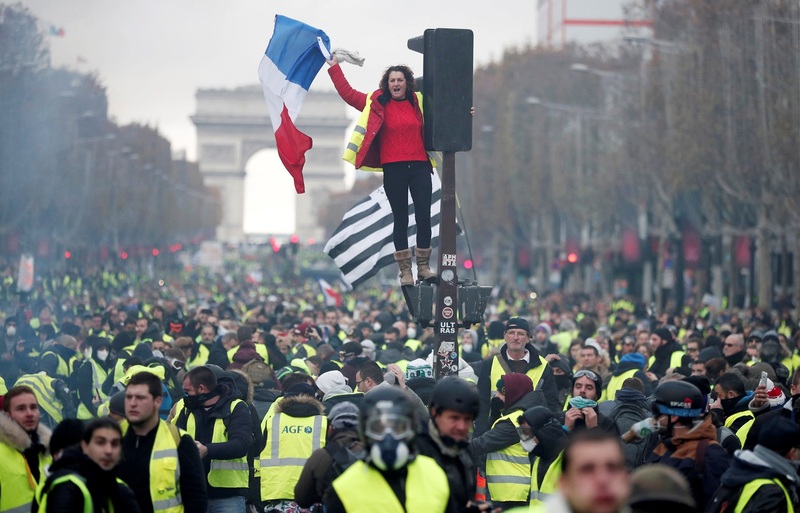 From the peasants’ march in Delhi to the Yellow Vests in Paris, the world-wide bursting forth of people’s anger only underscores the fact that neoliberal capitalism has reached a complete dead-end. Nothing shows the crisis of neoliberal capitalism more clearly than the popular uprising in France that is occurring under the banner of the “Yellow Vest” movement. Thousands are congregating in Paris over week-ends to protest against the intolerable burdens being imposed upon them in the name of “austerity” and to demand that resources be raised instead through taxing the rich. This movement had begun initially as a protest against the diesel price-hikes, but has now taken on a more general character and is drawing huge support from the people. There is an effort in liberal circles to portray the movement as being sponsored by a combination of the extreme Left and the extreme Right, and as one that would ultimately serve to strengthen the fascist forces. But this is the typical tactics employed by these liberal circles to deny people’s grievances that find expression in such movements, and to garner support for themselves by invoking the bogey of fascism. True, France has a strong fascist movement, but there is no link between that movement and the Yellow Vest agitation. And who benefits politically from this agitation will depend upon the actions of the various political formations; it cannot be glibly forecast. In fact, the movement itself has no political backers and its demands, like relief for the people and taxes on the rich, have nothing to do with the Right. On the contrary, these are progressive demands arising from the dire straits to which neoliberalism has pushed the working masses. The roots of this distress have to be clearly understood. In a period of crisis, since output and employment growth slows down, so does the growth of government revenue. If the fiscal deficit is to be controlled, and European Union rules stipulate that it must not exceed 3% of the gross domestic product, then government expenditure must also be curtailed. This has two effects: first, it aggravates the crisis through further curtailment of aggregate demand; and second, since such an expenditure-cut typically affects welfare expenditure the most, it causes a further squeeze on the working poor. The working poor,, therefore are hit in three distinct ways: first, by the original crisis itself; second, by the aggravation of the crisis via the response of the government through expenditure cuts; and third, by the direct loss in living standard that is caused by the fact that the cut is usually in welfare spending. Widespread people’s protests under these circumstances, as is happening in Paris, are hardly surprising. What, it may be asked, would happen if the government did not curtail its expenditure? There would obviously be an increase in the size of the fiscal deficit, which would be frowned upon by finance capital and would also violate the EU rules. But even assuming that the French government could ignore these factors, it would nonetheless face a more serious fall-out from the increase in the fiscal deficit. If we compare the two situations, one where the government has stuck rigidly to the 3% fiscal deficit target and one where it has exceeded that limit because of refusing to cut government expenditure by as much as the fall in revenue, then the current account deficit on the balance of payments in the latter situation will be higher than in the former. This is because a part of the higher aggregate demand in the latter situation would have “leaked out” abroad in the form of a higher current deficit. The need, therefore, would be for larger external borrowing to cover the higher current deficit; but, precisely because the fiscal deficit is larger, international finance capital will be unwilling to give larger loans to sustain the larger current deficit. In other words, running a larger fiscal deficit may be manageable if it causes no expansion in the current account deficit; but if it does, then the country in question will face a problem. The constraint upon enlarging the fiscal deficit, therefore, is not just something which arises because of false perceptions; it is actually a structural constraint. To see the nature of this structural constraint, let us imagine an alternative scenario where France imposes import controls to ensure that the larger fiscal deficit does not create a larger current deficit, i.e, that the larger aggregate demand that gets generated compared with a situation where the fiscal deficit is kept controlled to within 3% of the GDP, causes an increase entirely in domestic output and employment, and does not spill over into larger imports. In such a case, there will be no need for any additional external borrowing on account of the fiscal deficit target being exceeded. The structural constraint upon enlarging the fiscal deficit, therefore, arises from the fact that the aggregate demand generated by a larger fiscal deficit “leaks out” abroad, at least partially, i.e, from the fact that countries are not allowed to put up import controls under neoliberalism. The US alone has done so till now. No European country has done so; indeed no European country can do so without getting out of the EU itself, which denies such freedom to member countries. This is the dilemma of France today. Emmanuel Macron, the French President, went on television to address the nation and announced a series of concessions to the Yellow Vest demands. These included, increasing the minimum wage and postponing a diesel price-hike. Macron, however, categorically ruled out any increased taxation of the rich. His announced measures, therefore, would raise the fiscal deficit beyond what the EU permits. But even assuming that the EU takes a lenient view of France’s transgressing the fiscal deficit target, the fact that France will have to borrow more from abroad would imply that it would have to please finance capital. And that will require squeezing the people in some other way. Put differently, Macron could have taxed the rich and thereby kept to the fiscal deficit target; but he has ruled that out because it would be unacceptable to finance capital. He could have, even while increasing the fiscal deficit, imposed import controls in which case the increased aggregate demand would have been met through larger domestic output and employment and not caused a larger current account deficit; but that is not possible under EU rules, and would again be unacceptable to finance capital. Hence his measures would cause a larger fiscal and current account deficit, and if capital inflows are to finance it then the financiers would demand their pound of flesh in the form of “austerity”, either now or, at the most, after some time. Macron’s announced measures, therefore, while they may succeed in preventing any further protests for the time being, really amount to deceiving the people. They amount to buying peace now for a greater onslaught on the people later. In real terms, if the working people are to be provided with some relief, then this relief can come either at the expense of the domestic surplus earners; or from larger production at home through aggregate larger demand; or from resources borrowed from abroad. Since the rich are being spared, the first of these options is ruled out; and even if some increase in domestic output occurs because of this relief expenditure, some external borrowing will also have to be incurred, which means that a combination of the second and the third options will be used to pay for the relief. But any external borrowing would bring in its wake “austerity”, so that ultimately the burden of the relief will have to be borne by other sections of the working people themselves. Macron’s relief measures, in short, are a stalling, hoodwinking tactic, whereby some segments of the working people will receive relief at the expense of other segments of the working people. But the fact that Macron was forced to announce these measures testifies to the depth of the people’s anger which even the custodians of neoliberal capitalism cannot afford to ignore. From the peasants’ march in Delhi to the Yellow Vests’ demonstrations in Paris, we are witnessing a world-wide bursting forth of the people’s anger; but that only underscores the fact that neoliberal capitalism has reached a complete dead-end. In the contemporary world, the possibilities of war arise when nations have diplomatic failures.